After Friday's disappointment, we awoke in OKC with sights on central KS for a highly anticipated "High Risk" of severe thunderstorms (Saturday was the main reason we decided to take the trip from AHN). Most of the morning and afternoon turned out to be interesting from a meteorological standpoint. Elevated convection was forming early in western/central KS and moving northeast across the central part of the state. This convection and attendant cloud cover helped to minimize surface heating throughout a majority of the late morning/afternoon. After heading west out of McPherson, KS we targeted new convection (slowly becoming surface based via RADAR appearance) just to the southwest of Dodge City, KS. Due to a dead-end road (we got delormed! 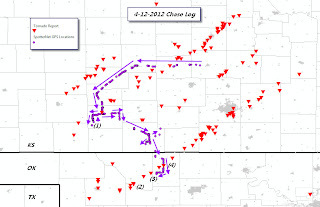 ), we were forced sit and wait, squinting as hard as we could, at a reported wedge tornado to our southwest (see Tornado location (1) on chase log map). As the wedge was approaching us, we were absolutely convinced that what we were watching to our west (albeit *very* poor contrast; couldn't even get a decent picture) was going to be the beginning of a huge day. Turns out, we were dead wrong. 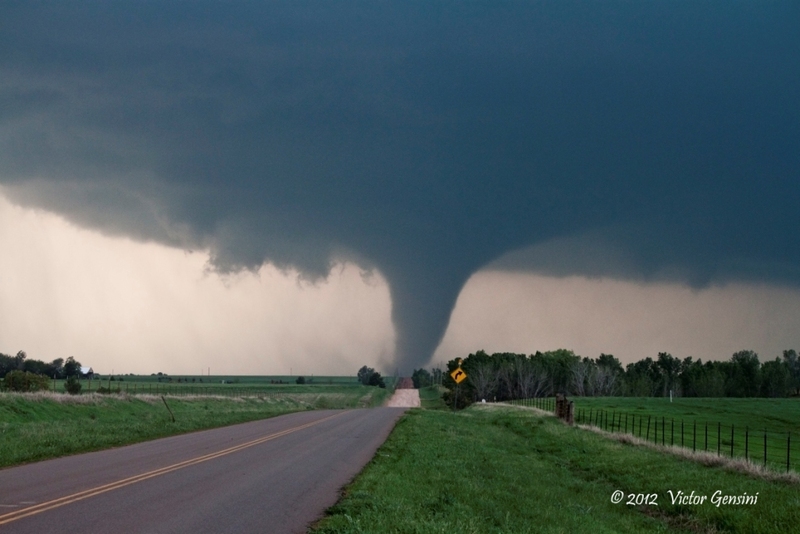 This tornado would not give us the pleasure of a good view as it lifted before coming within range of us. Considering it was only ~1:30 PM CST, we weren't too discouraged, as there was plenty 'o daylight left, and ample insolation now occurring just ahead of the dryline in western OK and KS. We stuck with this storm for a little while before deciding to bail to another storm to the south. The decision was largely based on two failed attempts at tornadogenesis and the relatively "cool" feeling of the inflow feeding the cell. We then intercepted a new cell coming out of OK (series of purple dots just north of the KS/OK border) and stuck with it for another two rounds of failed tornadogenesis. 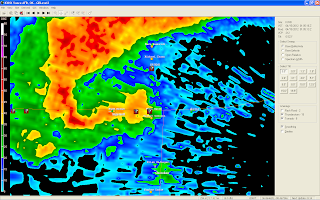 At this time, there were basically 4 mature supercells traversing northern OK/Central KS, and we seemed to be positioned on the best looking cell in terms of RADAR appearance. However, visually, the storm sucked! Argh! By this time, it's about 6:35 PM CST and I was thoroughly convinced that supercells we latched onto were not going to "produce" due to decreased surface lapse rates. I feared we were going home empty handed! We decided to give it one last go at a cell further to the south in Oklahoma that was heading toward Woods County. This storm looked much better visually and didn't have any other convection to the south to alter the thermodynamics of the inflow parcels. I started to feel much better as the storm began to show evidence of a nice clear slot, and it wasn't long before we spotted a tornado (see Tornado (2) on chase log). This cell was one heck of a tornado producer, that went on to produce confirmed tornadoes intermittently all the way on the western side of Wichita, KS! We observed at least two (maybe three?) 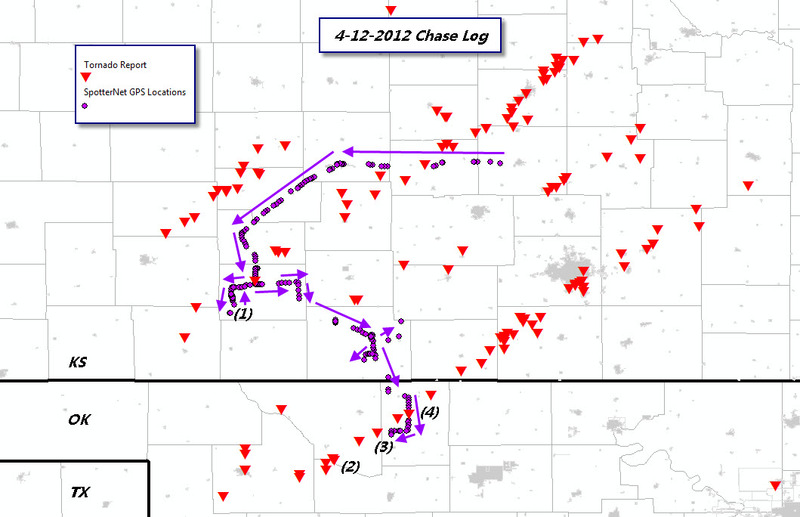 tornadoes with this cell before calling it a chase as the darkness settled in (see Tornado (3) and (4) on chase log). Tornadoes 3 and 4 were also the first time I have seen two tornadoes, or "sisters" as some chasers call them, at once. What a treat! We could have easily kept chasing given the isolated nature of the storm, but confirmed large tornadoes and darkness to not bode well together for chasing. Thus, we may have missed some of the nighttime show, but at least we'll live to chase again :-) After overnighting in Ponca City, OK, we made the trek back home to AHN. Overall, a very memorable chase! Nothing like being right in it ;-) Good thing GPS data was old! 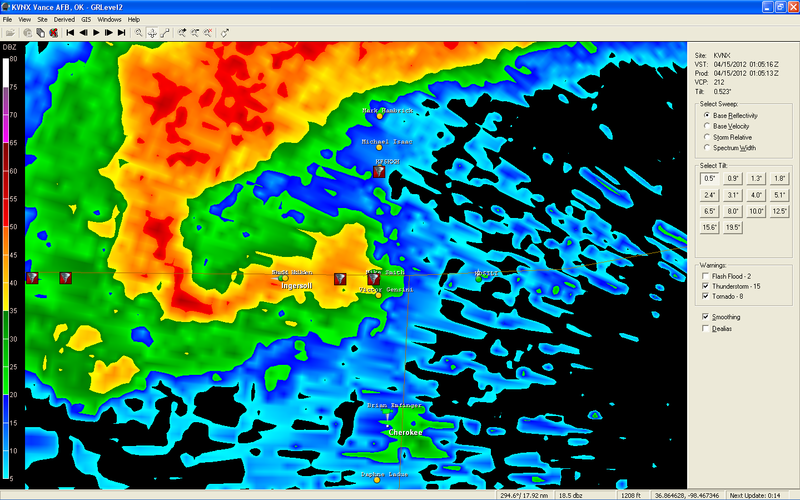 A new tornado now forming to the northeast. We've got sisters!